Qualifying at the Hungaroring proved even more eventful than expected, with first Massa's accident and then a failure of the timing system reminding us that the real world does not always go meekly according to plan. Felipe suffered concussion and is in hospital for observation after being hit by a spring lost from the rear suspension of Barrichello's Brawn ahead of him. The unerring aim of inanimate objects in such freak accidents brought to mind the death of Henry Surtees only a few days ago and I can only wish Felipe a full and quick recovery from his injuries. In contrast, the collapse of the timing system in the last laps of Q3 brought about a farcical situation, with drivers frantically comparing their times to see how they had done. Most seemed sure that Alonso had managed pole and, when the times were produced by harried officials, it turned out that he had indeed achieved top spot for the first time in ages. Publication of the fuel weights showed this to be partly due to Fernando being fueled only for a very short first stint but it was quite a feat even so. The Red Bulls lined up next, Vettel ahead of Webber this time and then Hamilton slotted into fourth, only marginally lighter than others around him. If he gets a good start, he could get the jump on those few ahead of him and then we might have a race indeed. McLaren have done a good job lately of fixing the car's problems and KERS means it will not be easy to pass on this circuit. Nico Rosberg claimed fifth, possibly goaded to greater efforts by the speed of his team mate in the first two sessions (Nakajima was third fastest in Q3). Like most in the top ten, the Williams are fueled for just over twenty laps, Kazuki slightly the heavier, and it is Jenson Button who has gone for a rather longer stint than the rest, a strategy that could pay off or cost him dearly if stuck behind slower cars. Eighth was unexpectedly lowly for a Brawn this year and the team are clearly hoping to improve on that in the race by running longer than the quickest cars. Heikki Kovalainen did not have the very latest upgrades on his McLaren and so did well to grab sixth and Raikkonen produced some of his old fire in hauling the Ferrari up to seventh. With Massa unable to race, Kimi will be the sole representative of the team tomorrow; Buemi moves up from eleventh into the top ten as a result of Felipe's absence. Barrichello's 12th position is explained by the breakage in his rear suspension that prevented him from graduating to Q3 but there is no excuse for the Toyota drivers - they seem to be slipping further back with every race. Piquet disappointed too, after showing well at first, and 14th may not be good enough to save his drive for the rest of the season. And so to the Beemers. Nick Heidfeld was second quickest in Saturday morning practice yet that disappeared when qualifying started and neither he nor Kubica could break out of Q1. This was much less than BMW, Dr Theissen and everyone else expected and the drivers' usual complaint of laps ruined by traffic merely confirms my opinion that the team holds the cars in the pits for too long in each session. There is promise in the improvements being made to the car now but it will not be this race where we see their full effect. Force India has improved but then so has everyone else. 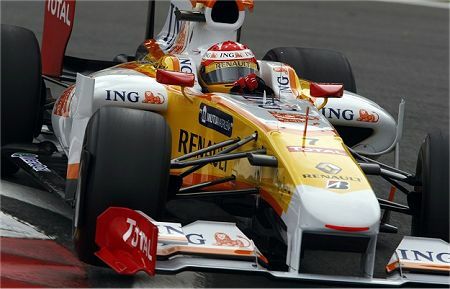 Matters were not helped by Sutil's car being unready until the dying minutes of Q1 and, judging by Fisichella's times, it would have been a very good effort for Adrian to break into Q2 anyway. And Jaime Alguersuari did the necessary, kept out of trouble and put his Toro Rosso in the last spot available, just as expected. Time will tell whether he can learn fast enough to make an impression. Perhaps because it has the reputation for being such a boring track, the Hungaroring often produces surprises and incidents, Button's first win was one and the eruption of the Alonso/Hamilton feud another. Qualifying has given us much to talk about already - is it possible that the race will produce even more? Jaime Alguersuari did the necessary, kept out of trouble and put his Toro Rosso in the last spot available, just as expected. Time will tell whether he can learn fast enough to make an impression. I was actually quite impressed with Alguersuari. Partway through and after the first runs in Q1, when most had set a lap, albeit on a green track, Jaime was in P15. Had the Spaniard been able to complete a final run, he may have improved, although I will admit it would only be down to an improving track rather than himself. But even so, I think he did make quite a good impression, only halted by a problem with the car. I'm was reasonably impressed with him. Next task: Get around lap one in one piece and finish maiden race. Also of note, I thought Buemi did well. P11, P10 after moving up due to Massa. Not a bad day for the Swiss lad. STR weren't lying when they said they had some improvements coming! Here's to hoping we've seen the last of fate's bitter twists this week, though. Between Surtees' death and Massa's bizarre accident some of the vague similarities to a weekend in '94 just nagged me all morning. I will be so glad when Speed takes over the race coverage again. As it is, I couldn't be more pleased that Alonso grabbed the pole. He actually had me laughing. All the other drivers were taking their helmets off and there he was helmet on running from driver to driver to get times. i think it's safe to say he's in no danger of losing his edge any time soon. All he has to do is keep everyone else behind him and nail those pit stops and I will be a happy little couch potato tomorrow afternoon. Ferrari finds itself in an interesting position. On the one hand, Massa will have three weeks to recover but, on the other, if his injuries are going to take more time heal then they will have to decide if they are going to use their test driver (still Badoer?) or, with an eye to the future, try out someone relatively new. When you don't actually have much at stake, this would be a perfect opportunity to do some scouting. It doesn't really fit their m.o. but I'd sure be thinking about it. Verasaki, James Allen was talking about at least 2 months out for Massa (which would mean Valencia, Spa, Monza and Singapore). The team has Badoer and Marc Gené as test drivers (Minardi's 99 line-up, curiously) and usually rotate then as reserve driver at each GP (Gené was there this weekend, so I guess Valencia would be Badoer turn). I guess Gené is the favorite as Badoer hasn't done an actual race of anything in years. The last time Ferrari needed to replace someone (Schumacher injury in 99) they went outside and got Salo who was the best F1 driver unemployed at the time, so I guess there's a small chance they might give Bourdais (who was using a Ferrari engine till the other day) or Piquet (who might be fired during the break and is close to Massa) what would be a final shot of breaking in F1. I very much doubt Ferrari would give any kid a chance as they don't have a young drivers program and show no interest in any young prospect. I'd say Gené is very likely to be at Valencia, but I hope they let Badoer race so he can finally score a point. Anyway, whoever be in the car in Valencia, Kimi will be under a lot of pressure, being beaten by Massa is bad, but at this point Massa is a very well-rated driver, his Valencia team mate is certainly gonna be someone who never impressed at F1 car at all. A bad show there and the Alonso rumors will get even larger. Thanks, Filipe. I'd forgotten about Gene. I'm not a Ferrari hater by any stretch but one of the things that has always bothered me is that they don't really risk much with their driver selection, always hiring the tried and true. It might be interesting to see Bourdais or Piquet in that car, though. Maybe since Schumacher is gone a sub would be fare a bit better than Salo (or even Irvine) got when Micheal was injured. It was great to see Lewis, Kimi and Alonso back to fight for wins. It will make the rest of the season a lot more interesting. It think it okay that Renault is penalized, but I don't think they should out of next race. I think Massa will be out for the rest of the season or at least 2-3 months. About a sub for Massa, then Marc Gene should have the highest chances, but even though I never liked him as a driver, it could be interesting to see Schumacher back. Because I think it will be more than one race then I think they will be looking for one with more race experience. The problem is the number free drivers are limited.